5 DIY Vinegar Cleaning Recipes That Don't Smell Like Vinegar! Homemade cleaners are great. The low-priced ingredients used in making them are great money savers and one batch can sometimes last you quite a long time if you have the right resources. However, you might not always know how to make your vinegar cleaning concoctions smell all that great. Below are ingredients and directions that will apply to all recipes listed here. Herbs – Use any herb with a scent that you like. Whole Spices – Don’t use ground spices. They can get stuck in sprayer bottles. Extracts (Optional) – These help make the scent even more powerful, further removing traces of vinegar. Essential Oils (Optional) – These further remove the vinegar flavor, and also help add more cleaning power to your mixture. Jars – Use these to store your cleaners. Spray Bottles – Use these for application of cleaners. Jar Funnel – For easily transferring cleaner from jar to spray bottle. Strainer – For straining out the herbs, spices, and fruit peels. Remove juices from peels to prevent clouding the solution and making it sticky. A citrus scorer or peeler makes this step a lot easier. Here are ingredients and directions specific to each recipe. Vinegar is a powerful cleaning tool with an overwhelming scent. 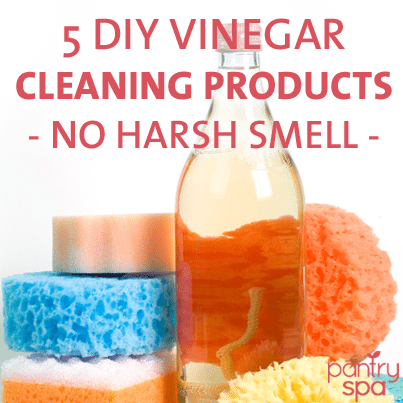 Learn how you can make vinegar cleaning solutions at home that will not smell strong. Combine cloves with cinnamon stick and almond extracts in a jar or container with a lid. Fill jar with vinegar until peels are submerged in vinegar. Seal jar or container and let sit for two weeks to one month. Strain the vinegar solution in a strainer. Place cheesecloth, mesh, or a straining lid over the jar and pour it through the funnel into the jar. Add rosemary sprig, and vanilla extract to a jar or other lidded container. Fill jar with vinegar, enough to cover the peels. Seal jar or container and let sit for two to four weeks. Pour the vinegar solution through the strainer. Screw a strainer lid onto the top of the jar and pour it through the funnel into the jar. Add thyme sprigs to a jar or other lidded container. Fill jar with enough vinegar to get peels submerged. Add mint sprigs and mint extract to a jar or other container. After solution is set, put a funnel in the jar and then rest a wire strainer in the funnel. Strain your vinegar solution carefully. Pour the solution through a funnel into the jar. Add pineapple rinds to a lidded container. After solution sets, put a funnel in the jar and then rest a wire strainer in the funnel. Not only do all of these cleaners have refreshing scents, they can be used on just about any surface or material. It is extremely important that you are sure to remove all juice from the peels and rinds that you use for the cleaner though, since the juice can be damaging to some surfaces.